We've partnered with Marlin Capital Solutions for 8 years to offer flexible financing options to help you sell more equipment. Welbilt KitchenCare® installation and planned maintenance contracts can be included in the financing at the time of the original equipment purchase. This Marlin program provides a wider credit box utilizing risk-based pricing on transactions below standard credit parameters. Marlin Capital Solutions flyer here. call Brian Dover at 856-505-4368.
Financing is avital tool that helps businesses get the equipment they need to succeed. By offering a financing option you help customers open new doors while you close more deals. A monthly payment option makes equipment acquisition easy for your customers. Through financing, they will be able to get new equipment or upgrade to the latest technology, all with lower upfront costs. Flexible pay structures also help them bundle costs for installation, service and smallwares to help them maximize their cash flow. By offering financing options at the beginning of the sales process, you can increase your transaction size and profit margins, while gaining customer trust and loyalty. Financing enables recurring selling opportunities for equipment upgrades and builds a long-term relationshipfor repeat business. you become indispensable in helping your customers get the equipment, innovation and services they need in a way that works for their budget. Offering financing to your customer enhances your value proposition. Take advantage of flexible pay structures. Bundle costs for installation, service and taxes. Close more sales faster by offering financing options at the beginning of the sales process. Control the sale by offering “one-stop shopping” - equipment, innovation, servicing and financing all in one package. Increase customer loyalty by being a single, convenient source for quality products and flexible affordable financing options. Do you really sell a total solution? If you are not currently offering a financing option when closing new sales, you are missing a critical opportunity. Providing customers with a way to finance their acquisition can make the difference between high growth and low growth. Financing is available to qualifying customers within the 50 United States and Canada only. Small business owners face the constant challenge of managing cash flow while investing in improvements to operations. Today’s successful business leaders are able to acquire new equipment to keep their businesses competitive while preserving working capital. Our partnership with Marlin provides your customers with flexible financing solutions to acquire the equipment they need without an up-front cash investment. With Marlin, you deal with a dedicated Marlin representative, ensuring personalized one-on-one service from an experienced account manager. Deals are approved quickly – usually within two hours and Marlin offers simple one-page documentation to help you close faster. Why recommend Marlin for your customer's financing needs? Financing enables a customer to make payments over time and with Marlin's flexible solutions, those monthly payments can be tailored to fit customer needs. Financing reduces upfront costs, allowing your customers to obtain the assets they need without affecting cash flow. It preserves working capital and existing credit lines and frees up cash for other operational expenses. Financing provides flexibility that purchasing does not offer, such as 100% financing with no money down, payment structures that match cash flows, a $1,000 minimum transaction amount and a variety of end of term finance options. Maintaining credit lines provides a safety net for business operation and fuel for growth. Financing provides your customers with a new source of credit, allowing them to keep existing bank lines intact for other needs. You may be able to deduct all or a portion of your equipment cost in the year it is purchased or financed. Any amount over the first year deduction cap may also be depreciated over the next several years, giving them an ongoing tax deduction Consult your accountant for specific tax saving information. All Welbilt equipment, installation, service and freight costs can be financed under one affordable monlthy payment. Marlin provides franchise financing fro equipment, working capital, re-imagining and new locations. Our simple method for financing helps you acquire your new Welbilt equipment quickly and conveniently. A monthly payment quote is included on every proposal for Welbilt Finance. Credit applications can be received directly from your customer, via email or taken over the phone. Upon completion, a credit decision is made within 2-4 hours. Upon approval, the finance documentation package will be completed and sent to your customer for signature. Once the signed documentation is received, a purchase order is issued. Welbilt pays the vendor and collects finance payments from the customer. 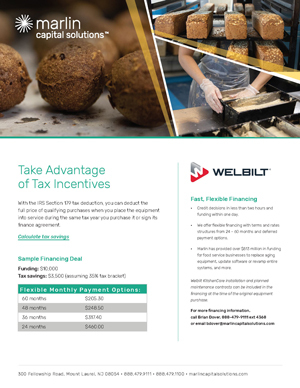 With just five simple steps your customers can finance the Welbilt equipment they need to help their businesses thrive. *Credit & equipment restrictions apply. This program does not assume your company will qualify to take advantage of the IRS Section #179 depreciation schedule which allows rapid first year depreciation of certain assets acquired. The amount of previous depreciation your company may have used may affect your ability to utilize the elections. Please consult your tax advisor or accountant for additional information. Equipment must be purchased and placed in service by 12/31/19.